Make sure that image loading is turned off when you check your email on your laptop and phone. There are services that will notify the sender of an email when you open a message and sometimes even from where. These services work by sending an invisible pixel that loads just like an image would. You may want to test some of these services (such as ToutApp or Yesware) to see what kinds of information they make available about people. To turn off images in Gmail, click on the Gear icon, and then go to Settings->General->External Content. There’ll be a button that says “ask before displaying external content.” You can choose to allow or block images from specific senders. 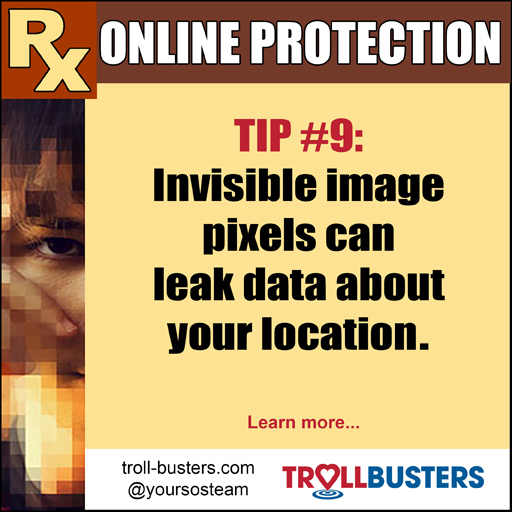 It’s not just image loading that can give away your location, though. Checking into places on social media or registering publicly for events can do that as well. Eventbrite, Meetup, and other places may publish their guest lists publicly or make that information available to other members. Both Facebook and Twitter allow you to post your location as well, so double-check your settings. (Facebook’s Privacy Checkup can give you all sorts of information about what you’ve shared and are sharing.) You may feel comfortable publicizing this information. Just make sure you’re doing it deliberately and not signaling that your home is empty to thieves.